White flowers, III–IV; yellow foliage throughout the year; height 61–75cm; spread 31–45cm. Outstanding plant for sheltered but open sites, but it i tender and should not be planted where temperatures can drop to –10°C. Found by George Hunt who gave all of his stock away in aid of the National Cancer Research Campaign. White flowers, with deep pink buds; height 61–75cm; spread 31–45cm. 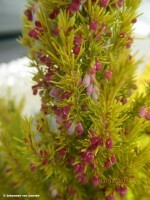 Flower buds bright dark pink, contrasting with pale yellow-green foliage, opening white; foliage yellow, fine; habit upright. Seedling raised by Helmut Hiedl (Altusried, Germany). Resistant to Pestalotiopsis (an endophytic fungus that attacks heathers); suitable for cultivation under glass. See http://www.hiedl-gbr.de/aktuell2.htm (accessed 2 January 2015).